Let’s face it—we can all be a little impatient sometimes. This impatience multiplies when we’re juggling a few activities at once. Throw a time constraint into the mix and all we crave is instant results. Whether it’s finding the fastest route to a destination or simply choosing a grocery line with the least amount of people and products ahead of us, saving time can mean the difference between getting results and getting nowhere. This concept also applies to the digital world, where internet speeds have reached an all-time high and we can obtain limitless amounts of information and resources with just one click. With approximately $8 billion being spent on video advertising alone, companies are incorporating a more visual approach to help reach out to us consumers, and the motto is simple: speed creates traffic. While this concept may not apply in the real world (because no one likes actual traffic), in the world of online authority, the loading speed of your website can either increase traffic on your site or cause you to lose potential business growth due to a simple lack of accessibility. You can have the most informative, visually enhanced site on the web and still fall prey to competitors who may lack the proper visuals and content but are much more accessible. 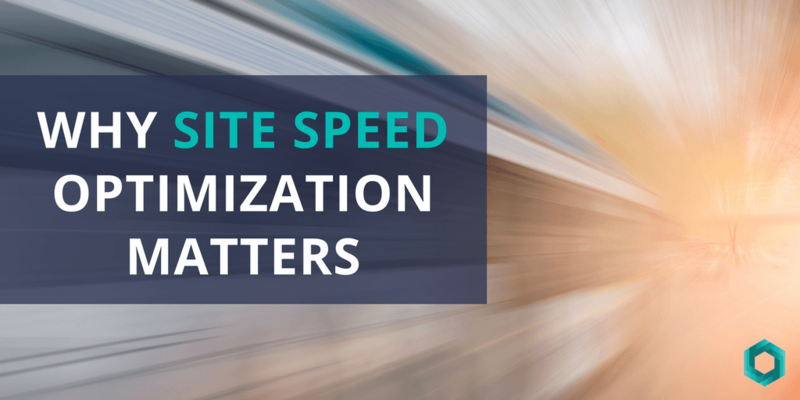 To optimize the speed of your website is to offer the ultimate user experience; the idea is to “hook” them while you’ve got their attention, and what better way than to ensure you’ve optimized your user’s experience than by optimizing your delivery? If you’re a business looking to boost your online sales or simply increase site traffic and visibility, you’ve only got a few seconds to engage users—any longer than that and it can create a negative experience for your consumers, many of whom will be less likely to revisit your site simply because they don’t want to wait so long for the page to load. A case study at Radware discovered that 51% of customers abandon purchases on websites with a slow page load. This creates crawl issues, which can lead to lower search rankings and pages indexed, which will also eventually yield a higher bounce rate, and ultimately ends in low conversions. The key to preventing this grand snowball effect lies in ensuring your site is working at an optimal speed to help deliver results before your viewers lose interest. This rule of speed should also be applied to mobile sites. We spend the majority of our time performing daily functions on our phones—purchasing gifts, booking vacations, even ordering meals are now accessible via mobile devices to deliver a faster response. Going mobile is only half the battle—making sure your mobile site is keeping up with the fast-paced demand of today’s on-the-go consumer is an important key to strengthening visitor engagement. What’s Slowing Your Site Down? Plug-ins: Flash, for instance, has potential to slow the speed of a site down to a crawl. If a plug-in is not necessary, it’s better to just avoid. Illegible font sizes: you may have an incredibly fast mobile site, but if a user has to pinch and zoom to read the font, speed is irrelevant. Design themes: Ever hear the phrase “you can never have too much of a good thing”? Well, if this motto was a website, it would probably be a terribly slow one. Over-cluttering your site with a heavy design theme can take away from an otherwise pleasant user experience. Not all themes provide quick page load speeds. Unoptimized images: JPEG and PNG images often come with extra data embedded into the file, so optimizing the image to remove that extra data will make these images more accessible without reducing their quality. Landing Page Redirects: Additional HTTP requests are triggered when redirecting, which delays page rendering. Each redirect triggers a HTTP request-response, which can happen multiple times and decrease site performance. Luckily, there are ways to help determine if your site is performing at an optimal speed. Popular sites like Google PageSpeed Insights, Pingdom and GT Metrix allow you to test the speed of your website by simply entering the site’s URL. You can also analyze your results and compare to industry benchmarks to help better pinpoint what’s causing your site to crawl and how you can improve it. All in all, we’ve learned that fast results yield positive user reactions. The faster you can deliver reliable, informative content to consumers, the more likely these consumers will revisit your site and help boost site traffic. This is why site speed optimization matters. How long does it take a user to access content on my website? Am I providing a positive experience to my users with my current page load time? How can I optimize the speed of my website to ensure a more positive experience and help boost site traffic without compromising appearance and quality? The team here at Clicc Media Inc can help provide answers to these questions and so much more. Call us at 954-271-3111 or fill out our contact form to schedule a consultation.